The United States Senate overwhelmingly pushed through controversial legislation reasserting support for U.S. allies in the Middle East in a recent bi-partisan vote. The bill continues multi-billion dollar financial and military aid to the Zionist state of Israel, renewed sanctions on Syria and an anti-boycott, divestment and sanction of Israel provision, that opponents argue is unconstitutional. 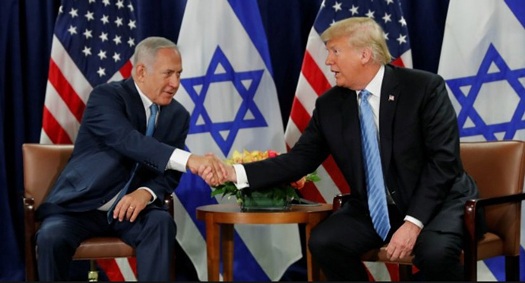 The “Strengthening America’s Security in the Middle East Act of 2019” or (S.1) combines four bills that confirms $38 billion in assistance to Israel over 10 years and a section “Combating BDS Act of 2019” that criminalizes anyone participating in targeted boycotting, divestment and sanctioning the Jewish State. The bill passed Jan. 28. It takes particular aim at the Boycott, Divestment and Sanctions Movement (BDS) for Palestinian Rights—a global rights collective. “This device is something that really intimidates the Zionist lobby,” said Mauri’ Saalakhan, director of operations with The Aafia Foundation, a human rights organization. Mr. Saalakhan told The Final Call that the BDS movement is patterned after the boycott, divestment and sanctions efforts that originated in the struggle against apartheid South Africa and has become the number one target for intimidation on many different levels in the United States. The bill was introduced in the Senate in early January during the 35-day partial government closure. Democrats tabled the bill in a political quandary vowing not to pass any legislation at the time. Although most Senate Democrats supported the bill after the government reopened Jan. 24, not all were on board. “While I do not support the BDS movement, we must defend every American’s constitutional right to engage in political activity. It is clear to me that this bill would violate Americans’ First Amendment rights,” said Senator Bernie Sanders (I-VT), who voted against the bill, to Reuters. The bill passed the Senate 74-19 and seven abstentions and now is set to go to the House of Representatives. Among the Senators who voted against the bill was 2020 Democratic presidential candidate Kristen Gillibrand (D-NY). Two other presidential contenders, Senators Corey Booker (D-NJ) and Kamala Harris (D-CA) abstained from voting on the bill. The bill was sponsored by Senators Marco Rubio (R-FL), James Risch (R-ID), Cory Gardner (R-CO), and Mitch McConnell (R-KY) with some Democrats support, but it was widely seen as an attempt to legally encroach on the rights of dissenting voices who criticize Israel. The bill authors said the legislation empowers state and local governments in the U.S. to legally cancel contracts and services with entities that choose to boycott the State of Israel for human rights infractions against the Palestinian people. While soliciting fellow lawmakers Jan. 8, Mr. Rubio argued the anti-BDS provision in the bill does not outlaw boycott, divestment and sanctions. “If a United States company caves to this pressure and decides it’s going to boycott or divest from Israel, they have the legal right to do so, this doesn’t outlaw it,” he said. However, if a state or local government decides it’s not going to do business or issue contracts to a company that’s boycotting or divesting from Israel, they have a right to do that, contended Mr. Rubio. The American Civil Liberties Union opposes the bill and argues it directly infringes on First Amendment rights and is a reminder of “McCarthy era” America when the government engaged in witch hunts and anti-Communist loyalty tests on American citizens. 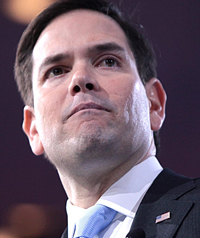 “Senator Rubio suggested that not only should states be free to boycott the boycotters, they have the right to boycott them. That’s a troubling proposition,” said a Jan. 9 statement from the ACLU. “First Amendment rights belong to the people, not the government. The government cannot impose its views on people or punish them for expressing views that the government disagrees with,” the statement said. The anti-BDS provision is couched within the overall bill. The BDS movement is a worldwide effort at pressuring Israel to comply with international law and end tacit support for its subjugation of Palestinians. Solidarity with the movement has been increasing. “They (Israeli government) recognize this as a threat, and they are willing to do just about anything in their power to stamp out that threat,” said Mr. Saalakhan. The anti-BDS bill is part of a larger campaign to curtail pro-freedom and justice for Palestinians actions argue opponents of the bill. It comes at a time when anti-Zionism individuals and organizations critical of Israeli policies like the Honorable Minister Louis Farrakhan of the Nation of Islam, educator and commentator Marc Lamont Hill, rights activists Angela Davis and Tamika Mallory are being targeted by Jewish attack groups. “This is the biggest threat to free speech in the country right now,” said Gadeir Abbas, Senior Litigation Attorney at the Council-American Islamic Relations in a telephone interview with The Final Call. “The effort to suppress pro-Palestinian voices is real, it’s on the federal level and in 26 states,” he added. CAIR announced a lawsuit Jan. 9 on behalf of former Maryland lawmaker Syed Saqib Ali seeking to prevent an Executive Order forbidding contracts with those who boycott Israel that requires Mr. Ali to certify in writing that he will not boycott. CAIR filed a similar suit in December 2018 for Bahia Amawi, a Texas speech pathologist who was fired for refusing to sign a statement certifying that she does not, and will not, boycott Israel or Israeli settlements. Although the (S.1 bill) was sidelined, then pushed through and has several steps to go before it can move to become law, activists don’t expect the anti-BDS effort to disappear. The bill is the latest attempt to frame laws to criminalize people who protest Israeli state repression of Palestinians. Previously in 2017, the bi-partisan “Israel Anti-Boycott Act” (S.720 and H.R.1697) was introduced and eventually defeated. That bill sought to impose criminal penalties, including up to 20 years in prison and $1 million in fines, against individuals who support the international call to boycott Israel and products from its illegal settlements. “The courts really do protect free speech very well, and the right to boycott a foreign country is a core liberty that the courts have protected time and time again,” said Mr. Abbas.